At the time that the original Texas Chainsaw Massacre was released in 1974, modern horror franchises were a rarity. The classic monsters of old had, of course, spawned many sequels during their Universal heyday and later remakes in the Hammer era but the groundbreaking slasher films of the then-current day  seminal shockers like Psycho and Texas Chainsaw  did not immediately generate follow-ups, for whatever reason. But once the 80s arrived and horror hits were being spun into franchises with increasing frequency, studios decided that it was time to excavate their back catalog and cash-in  hence the return of characters like Norman Bates and Leatherface to the horror fold. Because Norman Bates was such a rich character, portrayed so compellingly by Anthony Perkins, the follow-ups to Psycho fared well  even with the burden of having to pick up over two decades since the original. Making a franchise out of The Texas Chainsaw Massacre, on the other hand, was far more of a challenge. Every film is a collaborative effort  assembled by many hands, dependant on various elements in order to emerge in whichever way it does. Thats why trying to duplicate what made a film a success is always a tricky, often futile, endeavor. But even more than most films, the original Chainsaw was an especially alchemical act. The brutal shooting conditions, in which the cast had to suffer through the unforgiving Texas heat while filming for long hours  often within the stifling location of the Sawyer farmhouse, trapped with the rising stench of decomposing cattle parts  imprinted an authentic air of real world madness onto the film. Thats the kind of guerilla filming experience that would not ever be duplicated, not even in the most low budget Hollywood enterprise. That arduous shoot was essential to what made the original TCM what it is, though, so its not surprising that the sequels, remakes, and prequels all, to different degrees, failed to measure up to that first film. Being that Chainsaw is too irresistible a brand name for studios to resist, though, they have never stopped trying to recapture lightning in a bottle (see Texas Chainsaw 3D for the latest example of that). The first sequel, the only one helmed by Tobe Hooper, was reviled by most critics and fans for veering into gonzo black humor but has since been rightly reassessed as one of the highlights of 80s horror. But the flak that TCM 2 initially received for its perceived mistakes was a key influence on the direction that the second sequel would take. Once the rights to Texas Chainsaw Massacre were acquired by New Line Cinema in the late 80s, it was inevitable that theyd try to relaunch the franchise. As every horror fan knows, New Line achieved their initial success thanks to the Nightmare on Elm Street series and The House That Freddy Built proved themselves to be adept at building successful franchises (not just in horror, as they also scored big with the likes of the Teenage Mutant Ninja Turtles and the House Party films) so the prospects for the return of Texas Chainsaw looked good. With Leatherface: The Texas Chainsaw Massacre III, the second film would be ignored and the new film would act as, essentially, the first sequel to the original. It would also dispense with the comedic approach the Hoopers sequel took and return the series to the pure horror that the original was known for (although its often forgotten or ignored that the original had its share of dark humor). Jeff Burr, who had developed a name for himself in the genre with the well-regarded films The Offspring and Stepfather II, was tapped to direct and noted splatterpunk author David J. Schow (“The Kill Riff”) penned the screenplay. The plot is as basic as it gets  a young couple (played by Kate Hodges and familiar 80s horror figure William Butler) in the throes of a break-up are taking one last trip together as Hodges character is driving her fathers car from California to Florida. They take an ill-advised detour while in Texas and before long, theyre fighting to avoid being dinner, or trophies, or whatever for a clan of cannibalistic killers (whose ranks include then-unknown Viggo Mortensen). A weekend warrior/survivalist type (Dawn of the Deads Ken Foree) is pulled into the action as well but will assault rifles prove useful against Leatherfaces chainsaw? Not so much. The shoot was a difficult one and compounding that, the MPAA did not show the film any love (it was submitted before the board 11 times), demanding extensive cuts, making sure Leatherface was as neutered as possible before it hit screens in January of 1990. Upon its release, Leatherface didnt quite cut through the competition, earning reactions ranging from indifference to disdain, but I maintain an enduring nostalgia for this movie  admittedly less for its own cinematic virtues than for the period of time it embodies. 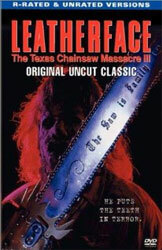 Leatherface came out at a time when horror was very scarce on the big screen. Even a kind of slow-ish year for the genre like 2012 seems like a deluge compared to what was in theaters in the late 80s/early 90s when genre films came out in drips and drabs so just about any horror movie from that time strikes a nostalgic chord with me as, even if a movie was lackluster (and they usually were), I always appreciated the chance to see horror on the big screen. Every release was a reason to keep the fire of fandom burning. The best things to come out of Leatherface were the pimped out Chainsaw (insisted on by New Line head honcho Robert Shaye) with the engraved motto The Saw Is Family and the clever teaser trailer that referenced the Arthurian legend of The Lady In The Lake  one of the best horror trailers ever made. The movie itself, though, is fairly unremarkable. Not terrible, just unremarkable. Its a reminder of a time when horror films were usually pale imitations of better days, made for and marketed to a diminished but still stubbornly dedicated fanbase patiently waiting for the genre to rally. You had to be a real horror fan to stick with the genre back then and as such I continue to remember Leatherface fondly.